The conflict that took shape in the 1790s between the Federalists and the Antifederalists exercised a profound impact on American history. The Federalists, led by Alexander Hamilton, who had married into the wealthy Schuyler family, represented the urban mercantile interests of the seaports; the Antifederalists, led by Thomas Jefferson, spoke for the rural and southern interests. The debate between the two concerned the power of the central government versus that of the states, with the Federalists favoring the former and the Antifederalists advocating states’ rights. Hamilton sought a strong central government acting in the interests of commerce and industry. He brought to public life a love of efficiency, order and organization. In response to the call of the House of Representatives for a plan for the “adequate support of public credit,” he laid down and supported principles not only of the public economy, but of effective government. Hamilton also devised a Bank of the United States, with the right to establish branches in different parts of the country. He sponsored a national mint, and argued in favor of tariffs, using a version of an “infant industry” argument: that temporary protection of new firms can help foster the development of competitive national industries. These measures — placing the credit of the federal government on a firm foundation and giving it all the revenues it needed — encouraged commerce and industry, and created a solid phalanx of businessmen who stood firmly behind the national government. Jefferson advocated a decentralized agrarian republic. He recognized the value of a strong central government in foreign relations, but he did not want it strong in other respects. 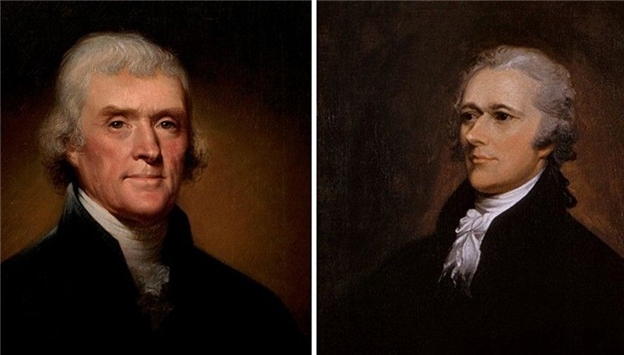 Hamilton’s great aim was more efficient organization, whereas Jefferson once said “I am not a friend to a very energetic government.” Hamilton feared anarchy and thought in terms of order; Jefferson feared tyranny and thought in terms of freedom. The United States needed both influences. It was the country’s good fortune that it had both men and could, in time, fuse and reconcile their philosophies. One clash between them, which occurred shortly after Jefferson took office as secretary of state, led to a new and profoundly important interpretation of the Constitution. When Hamilton introduced his bill to establish a national bank, Jefferson objected. Speaking for those who believed in states’ rights, Jefferson argued that the Constitution expressly enumerates all the powers belonging to the federal government and reserves all other powers to the states. Nowhere was it empowered to set up a bank. Hamilton contended that because of the mass of necessary detail, a vast body of powers had to be implied by general clauses, and one of these authorized Congress to “make all laws which shall be necessary and proper” for carrying out other powers specifically granted. The Constitution authorized the national government to levy and collect taxes, pay debts and borrow money. A national bank would materially help in performing these functions efficiently. Congress, therefore, was entitled, under its implied powers, to create such a bank. Washington and the Congress accepted Hamilton’s view — and an important precedent for an expansive interpretation of the federal government’s authority.